Christian Siegel and Markus Schleimer founded Siegel Schleimer Ingénieurs-conseils s.à r.l. in 2010.
studied electrical engineering and information technology at the University of Karlsruhe (TH) / KIT – Karlsruhe Institute of Technology. He worked at Chauffage SIEGEL s.à r.l. in Mondercange, Luxembourg from 2002 to 2010. Beside, he worked in research and development at the centre for fuel cell technology in Duisburg, Germany (Zentrum für BrennstoffzellenTechnik (ZBT)), from 2008 to 2011.
studied technical building equipment planning in Cologne, Germany. 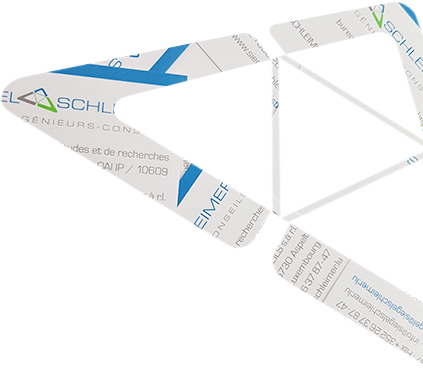 Has managed Josef Schleimer GmbH – Beratende Ingenieure in Trier, Germany since 2002. Several of the projects he has realised have won environmental awards. Training as a state-certified building equipment technician and further education in technical environmental protection. Since 2000, partner at Josef Schleimer GmbH – Beratende Ingenieure in Trier, Germany. studied technical building equipment planning at the Fachhochschule Trier, Germany. Many years and wide-ranging practical experience in the installation of HVAC systems. Training as a facility operator for HVAC systems and several years of practical experience in the installation of such systems. Studied technical building equipment planning at the Fachhochschule Trier, Germany from 2009 to 2013. Training as a technical draftsman HVAC. studied electrical engineering at the Fachhochschule Trier, Germany from 2004 to 2009. Many years of experience in planning of electrical installations. educated as a technician in electrical and communication systems at the Lycée Technique d’Esch-sur-Alzette and at the Lycée Technique des Arts et Métiers. In 2015 he finished the BTS Génie Technique education at the Lycée Technique des Arts et Métiers. Education in supply technology, as well as several years of experience in the implementation of technical plant engineering in Luxembourg. Education in supply technology, as well as more than 30 years of experience in the implementation of technical plant engineering in Luxembourg. Training as an electrician and further education in electrotechnics to achieve the master craftsman certificate. Many years and wide-ranging practical experience in the installation of photovoltaic systems and autonomous energy systems. Education in technical building equipment, as well as a long-standing experience in the execution of technical installations in the Grand-Duchy of Luxembourg. studied electrical engineering at the Fachhochschule Aachen in Aachen, Germany from 2000 to 2004. Many years of experience in planning of electrical installations.